If a picture speaks a thousand words, how many words, then, does a Monet speak? "Are you Rabbi Joseph Brandriss's granddaughter?" I think that was the first time anyone ever asked me that, especially since I infrequently encounter people who knew him. But when I walked into an unfamiliar French shul on Friday night, an adorable older man addressed me with that very question. The family I was staying with for Shabbat had told him about me, and we quickly got along. Taking me under his arm, he said he'd take me to Lille to visit my grandfather's shul and to meet a community of elders who knew him and his parents. At the Shabbat table in front of a house full of guests, my new friend recounted the d'var Torah (word of Torah) that my grandfather had presented to him some 65 years ago. Later, he offered to give me and some friends a private lesson in Torah and/or Jewish philosophy, and promised to introduce me to the young male (and female) Jews in the area. He also assured me that I wasn't the only one who shed a waterless tear when we first met. Okay, enough family history for now. The rest of this post shall speak for itself - partly because I just began a three week, three credit class, and it's a beckoning! But mostly because these pictures truly tell their own story. "Whatever, I just came from the gym." So here's to you, Columbia website: from the perspective of my grumbling stomach, I have not eaten since lunch and I feel like a punished child sent to bed without dinner. My sense is that it's humorous that my host sleeps in the kitchen/living room and therefore denies me a way to change the perspective of my estomac. Please don't tell my mother that I ate cereal bars for dinner, and to my mother, I'm on it... it's just that after studying the French list of kosher foods for about an hour and then realizing that anything crumb-producing or sugar-containing will be frowned upon, I came home almost empty-handed, -stomached, and too cold to care. I'm hungry for another cereal bar, but I wouldn't want to shock my system with this alien food - I'm pretty sure getting sick is out of the question in this très belle maison. Meanwhile, I offer a toast to the French (though the French toast they offer me is in fact hard and not dipped in egg nor cinnamon). I hail them for severely limiting electricity and water consumption. From my experience, many American homes and institutions (myself very much included) display minimal awareness of that which lies beneath the surface of lights, heaters, and water faucets. We turn knobs and flicks switches without fully appreciating our effects on the environment. Here, the forces that be force the French to heed mère Nature because heating and electricity is very expensive and hot water is limited. THAT SAID, I never fully lost my fear of the dark and I have split second nightmares every time I walk from the wash room to my sleeping room at night, since of course we're prohibited from keeping lights lit "superflously." On the bright (well, dark) side, I can't stay in the hallway for very long since it's unheated and I must watch that my toes don't freeze and stick to the floor. If they did, I fear that Madame would lament their clashing with the rest of the body in the painting outside my room (for whom I fear as well since she looks like she could use a sweater, or at least a shirt). The other night, my friend described her poor relationship with a previous host mom, and I began to imagine a scene of an abroad student raiding his or her host family. I localized my vision, and immediately a picture of water puddles on counter-tops entered my mind. Now I ask you, what does the following say about the house/-keeping here: if my host mom walked into the wash room and saw water on the counter-tops, she would gasp and understand with certainty my diabolic intentions. What I really mean to say is that I absolutely adore my host mom, and with every passing day we're growing to further get each other. She came home with an urn and havdalah candle for me, and when I asked to reimburse her she explained that "Hashem paid." I told her that I too appreciate Kabbalah, describing my unexpected appreciation of the Tania. She asked me if I have a fiancé in les États-Unis, and (unrelated?) offered me nail-polish remover for my chipped self-manicure. **Why hasn't postmodernism done away with the universal "they"? Do they all still share the same view? Didn't we kill the Father, Author, and Word? If there are a multiplicity of realities, how is it that they all agree?! Maybe they have some advice to offer the rest of the world, 'cuz who else in history shared such unanimous, harmonious opinions outside of them?! 'Spoiler' Alert: The end of this post contains the reason I'm alive. I jumped out of my house and into the streets. In my bag, a map; in my head, an intention to meet Paris. I ignored the former, but the latter guided me quite far. I didn't want to go another day without seeing the Seine, and about 12 minutes into my walk, I found her. Three minutes later, I was standing in front of Notre Dame. Let me rephrase that: I live a 15 minute walk from Notre Dame! I marveled at the outside for a few minutes until adrenaline urged me to continue on. Someone had told me about Shakespeare & Co., a legendary English bookstore across the river, so I used it as an excuse to explore the area. I love the independence and freedom of having minimal work (for now), and of being a foreigner in a new city that demands exploration. I LOVE walking the streets of Paris. And I LOVE that I don't have to take a camera anywhere because I can just revisit that Where! I love hearing French all around me (though I despise feeling excluded because of my weak speech). I love the cobble stone roads and that historical landmarks overwhelm this city, and I love that everyone is so damn stylish. I love that storekeepers and street-goers are mostly kind and patient with my embarrassing French, and I love that men (and women) greet each other with two kisses. I find it weird - but in a loving way - that seats outside cafés face the street so that people just watch you as you walk buy, and that it's the norm for people on the subway to stare unabashedly at fellow riders. I HATE that so many people smoke. I hate that there are so many homeless people (though I find it weird that some wear moderately nice jeans - pardon the crassness, but how French...). Simultaneously, I'm stricken by the abundance of people who appear middle to upper class, and wonder where the poor(er) live. I hate that the apparent lack of poverty makes me wonder where the poor reside; that I intuitively feel that there must be people suffering somewhere to allow for the formers' lifestyle. I intend to research this, and I'll report back with my findings. Though I never found Shakes. & Co., I got to know the area surrounding (and within a 4 hour walk of) my home. On my way back, I got distracted by signs for further local sites. Before heading over to Musée Carnavalet, a museum of Parisian history a few blocks from home, I saw a sign for "Mémorial du SHOAH." I followed it until I found the museum, outside of which stands a wall containing a list of French "justes," or righteous gentiles. A few deep breaths later, and after scanning through a long list of names, I found "Jeanne Rousselle," the woman who saved my grandmother, one brother and one sister, during World War Two. Madame Rouselle was the head of a sanatorium for children with respiratory diseases. My grandmother and her sister posed as nurses and their brother as a patient. 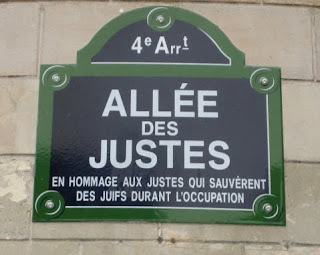 Another of their brothers was studying to be a rabbi at the École Rabbinique de France (Rabbinical School of France) and thus got to know the man who later married my grandmother. He escaped to Southern France but was then imprisoned. My grandmother and siblings used to save some of their food rations to send to him in prison, only to find out later that he'd died and they'd sent all the food for nothing. Decades later, when my great uncle nominated Madame Rouselle to be one of the righteous gentiles listed at Yad Vashem, they researched her and found out she'd hidden and saved 57 Jewish children. For everyone's safety, Madame Rouselle had never told the Jewish kids about the other Jews living there with them. My grandmother and grandfather (a"h) came to the United States and had six children, over 20 grandchildren, and as of late a handful of great-grandchildren. My grandfather served as a Rabbi first in France and then in Sudbury, Canada; Wassau, Wisconsin; Beacon, New York; Austin, Texas; and Silver Spring, Maryland, where he became President of the Washington Board of Rabbis. Even today, his shul in Silver Spring invites my grandparents' above-mentioned progeny to an annual Scholar-in-Residence Shabbat in my grandfather's honor. Seeing Madame Rouselle's name on that wall was viscerally, emotionally, and mentally moving, and I remain amazed that I'm currently breathing, writing, and praying just seven minutes from the monument. "Devant le Martyr Juif Inconnu incline ton respect ta piété pour tous les martyrs, chemine en pensée avec eux le long de leur voie douloureuse, elle te conduira au plus haut sommet de justice et de vérité. זכור את אשר עשה לך עמלק של ימינו אלה אשר הכרית גוף ונפש של שש מאות רבוא בני–ישראל תף ונשׁים -- ללא מלחמה." I ADORE her. She keeps a beautiful home, and has a particular way of doing everything, which I am quickly trying to learn. Though I'm sure she could afford a maid, we do our own dishes, take out our own garbage, and clean the (royal) tub and sinks after using them. She brings my slippers to the front door so that I don't enter in my boots, and she insists that we keep all lights and heat off when we're not in their direct vicinity. We eat simple, healthy food, and with it a fruit and this drink whose name I haven't yet caught but that supposedly puts one to sleep. She is extremely DIRECT, as in straight forward, which is one of my favorite qualities in people. She is quick to solve emergent complications (vegetarianism, etc. ), and expresses our solution in commands but ever so endearingly - "You will buy yourself two cheeses. You will use that to make sandwiches for school." She smiles infrequently, but that is somehow further endearing because it is simply her way, and she shows care in a subtler fashion. She is also deeply religious and ascribes many things to "Hashem's will," albeit without claiming complete observance. I think my first mistake expectation-wise was that I thought - since after all I'm in a modern Western country - that Paris would not be completely different from New York. Well that is completely wrong and at times confusing, but overall amusing, informative, and enlightening. And with that, I bid you Shavua Tov :). Finally, I arrived at my host's door - my host whose physique and temperament I'd imagined as Meryl Streep's in "Julie & Julia." And then this small, prim-looking blond woman opens the door, kisses both my cheeks, and without a word, walks me down a neverendingly long hallway that leads to a quaint bedroom, bed made, with original cubist and impressionistic paintings on the walls. But I ain't seen nuh-in yet. After placing my luggage in my room, Madame B. walks me further down the hall to a room that appeared a mixture of a dinner-party waiting to happen, an intellectuals-only cocktail hour, and the Louvre. The table was set with drinks and desserts, the furniture looked like it was just off the boat from an exquisite Sri Lankan textile shop, and the paintings on the walls made me debate going to a museum the next day. Said: "No No No, I did not sleep well. But thank you for waking me." Meant: "No No No, I am not still sleeping. But thank you for waking me." Seriously though, it feels just like Jerusalem, complete with cobble stone roads, men on the sides asking if you're "Juif" (Jewish) and want to try using tefillin, falafel stores and bakery aromas on every corner. After a very kind cashier helped me buy "halla" and directed me to a store with grape juice "casher," I stopped into this Jewish book store and wooooow. They had every piece of great Jewish literature, only in French. The Kuzari, Maimonides' "Guide des Egarés" (Guide of the Perplexed), and books by "Philippe" Roth. I was smiling so loudly I thought the cashiers might hear me - what a warm welcome! I quickly used a Hebrew-French dictionary to check a few words I'd been needing, and then headed out. I am about to venture into a great unknown. I hope to do so humbly, confidently, unapologetically, sensitively. Full of awareness and un-self-consciousness; boldness and openness. I am taking with me - as I always have - some STUFF of years past - pictures, quotations, scarves, friends, beliefs, fears, dreams, and leaving plenty of space to pick up some new ones. but clothing me as I take off to a new unknown. I hope to read English books and French newspapers, watch French movies & musicians & artists & children & slums & exhibits & people & fashion & prayer services & elders & nature & new countries & Jewish stories & world histories. Through plane and train, humble and vain windows, with coherent French exiting my mouth and good-looking French cuisine approaching it. Towns and gowns and whatever (iy"h) else.